When it comes to day spas, most people have a general picture in their head of what their services entail — images come to mind of a clean, relaxing space where professionals administer expert techniques to soothe and relax you. Massages, body scrubs, and facials are probably part of the mental picture too. There’s a reason for this — day spas have been around for a while, and most people, even if they haven’t personally been to one, have some kind of familiarity with their services. The Medical Spa, on the other hand, is a relatively new phenomenon that has exploded in popularity in the last ten or fifteen years. This has caused a little bit of confusion among would-be spa-goers — day spa or medical spa? What’s the difference? Has one replaced the other? What about places that offer both services? At Rejuvenation in Prince Frederick, we happen to be one of those places that offers both day spa and medi spa services, so we feel like it’s important to clear up the confusion. 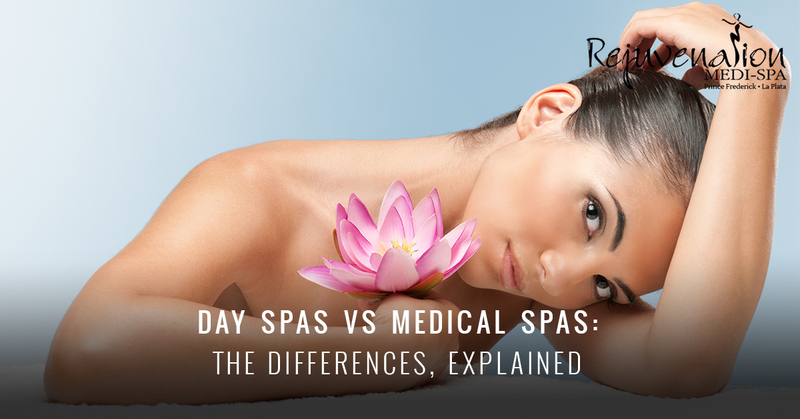 Day spas and medi spas are, in fact, quite different, but also similar in their overall goal. In this blog post, we’ll break down some of the differences. Day spas are the normal beauty spas you’ve known and loved your whole life. As we mentioned above, day spas offer services that rejuvenate and relax you, carried out by licensed professionals. Your mind, body, and soul is meant to come out of a spa feeling pampered and refreshed. While spa workers are professionally certified to do their job, the work isn’t medical in nature, and the end goal is to ensure that you come out feeling like a queen (or king)! Typical day spa service include treatments such as body scrubs, body wraps, spray tans, and eyelash lifts/extensions. You’ll notice one similarity these all share is that none of them are permanent treatments; this is an important factor that helps to differentiate them from being classified as medical; the intention is short-term treatment that comforts you and lifts your spirits. Medical Spas, unlike day spas, carry out medical procedures that are intended to improve and repair your skin and health. Many of these procedures have much more long-term (if not permanent) effects. Microdermabrasion, botox, laser hair removal, and tattoo removal are all examples of services you might find in a medical spa. Another difference is that these are carried out by medical professionals. Medical spas have an educated physician who oversees the spa, making it pretty similar to an actual clinic. With medi spas, your actual treatment is the end goal, rather than your comfort. The latter is, of course, a high priority, but ultimately, the main objective is achieving the coveted results of whatever procedure you’re undergoing. The ultimate goal of a day spa, regardless of the service offered, is to make you feel like royalty when you’re walking out; the procedures involved are meant to facilitate that. If luxurious basking is the name of your game, you really can’t go wrong with a day spa. Medical spas, as outlined above, are much more ideal for legitimate, long-lasting medical treatments. While the luxurious and relaxing spa environment is a factor, it’s not the main reason or intent behind the services. Medical spa services are aimed at making lasting improvements to your body that will de-age you and preserve your beautiful skin. At the end of the day, we can’t definitively say which kind of spa is best for you, because every single person is different and has their own unique needs. That’s why, at Rejuvenation, we offer both services. We want everyone in the Prince Frederick and La Plata areas to experience the wonderful feeling of true rejuvenation — come stop by, or contact us today!